not sure whether i prefer it in black and white or not hmmm! 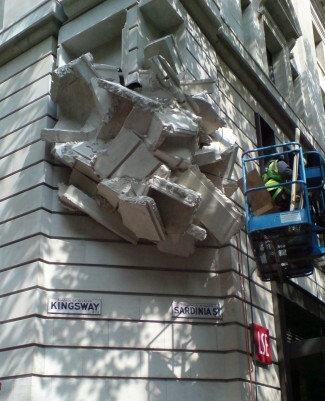 Richard Wilson (born May 24, 1953) is a sculptor, installation artist and musician. Richard Wilson’s first solo show was 11 Pieces and was given at the Coracle Press Gallery in London in 1976 and since then has had 50 exhibitions around the world. Wilson’s work is characterised by architectural concerns with volume, illusionary spaces and auditory perception. 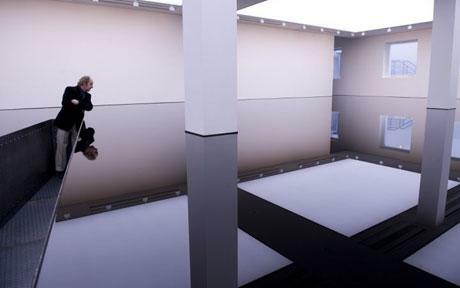 His most famous work “20:50”, a room of specific proportions, half filled with highly reflective used sump oil creating an illusion of the room turned upside down was first exhibited at Matt’s Gallery, London in 1987, became one of the signature pieces of the Saatchi Gallery. It is considered to be a defining work in the genre of site-specific installation art.